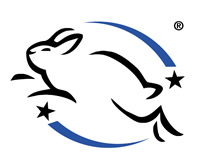 The Human Cosmetic Standard (HCS) and The Humane Household Products Standard (HHPS) are the only international standards for cosmetic products and cleaning products to confirm that the products and their ingredients have not been tested on animals. The right of use of the above mentioned standards are given only to companies that meet the conditions for all their products and their ingredients, or in other words to companies whose testing policy is completely liable to one of the standards. HCS and HHPS were launched in the 1996 by the International Coalition of Animal Protection groups from across the European Union and North America, including The European Coalition to End Animal Experiments, ECEAE, whose members are also Animal Friends Croatia. Approved companies to use HCS and HHPS labels on their products must not conduct or commission animal testing for their products and ingredients. As part of the condition, companies must introduce a fixed cut-off date beyond which they are not allowed to purchase any ingredient which has been tested on animals for their needs. Companies also agree to be open to an independent audit within 12 months of approval and then every three years thereafter. The Animal Friends invites everybody to purchase products of companies that meet HCS and HHPS standards and it negotiates with Croatian companies to gain the rights on the above mentioned standards. The white list has the names of companies that meet HCS and HHPS standards published on the top with the HCS mark, and this number will increase with time.